Have you ever had a feeling that some greater power in the market has singled you out and is doing everything in their power to make your trading life a misery. 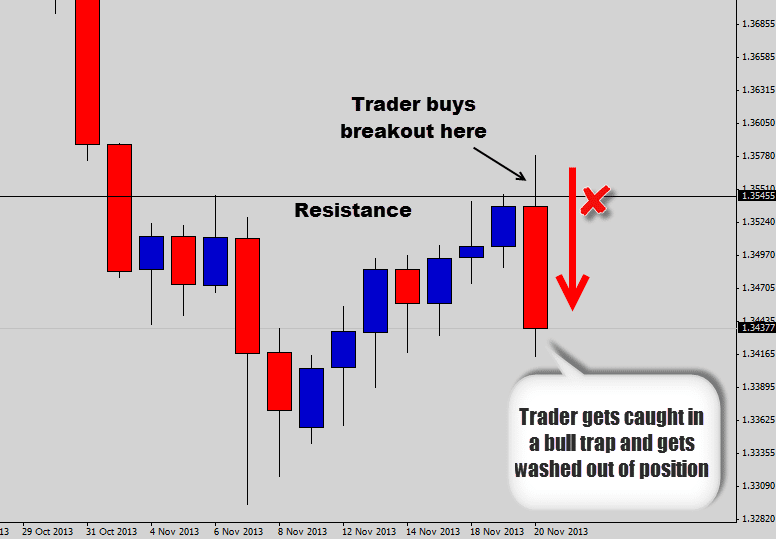 Because it seems every time you enter a Forex trade, almost immediately you find the market reversing on you? 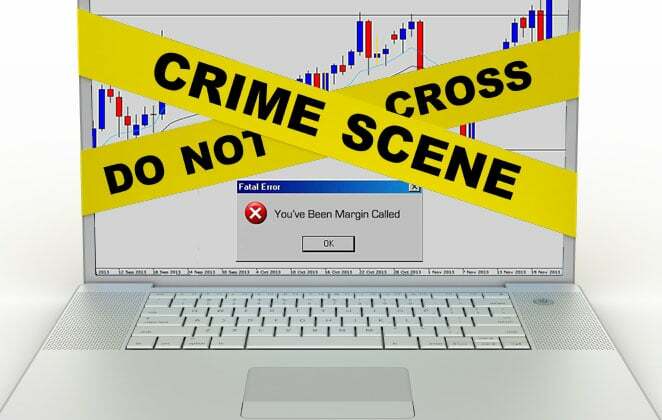 The market is probably just ‘rigged’, or it must be your broker stop hunting you right? Did you ever consider you might be chasing price around the chart, consistently entering the market at bad prices. In this article we are going to take a look at why ‘chasing’ price around the charts is impractical, ineffective and why it will unravel you mentally. 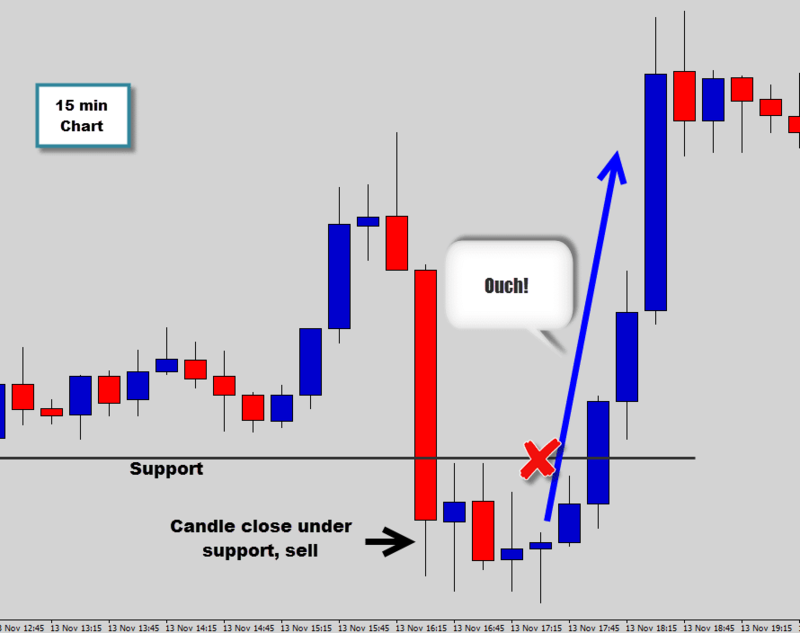 Have you ever been sitting in front of your trading desk, watching the candlesticks tick higher and lower and then noticed a significant price event unfolding in front of your eyes? This event could be price breaking through an important support or resistance level, or maybe a trend line. Whatever the situation, the price action makes your eyes light up like a Christmas tree. You whip out the trade order window as fast as you can. You proceed to enter a Forex trade at the ‘market price’ with a high level of urgency. You’re in the trade, fuelled up on adrenaline, and on the edge of your seat watching the market go crazy as price breaks through the key point on the chart. You’re thinking to yourself, ‘oh this is going to be a massive breakout and land me the big trade I’ve been waiting for’. Then all of a sudden the movement reverses and now you’re on the wrong side of the market. An event like this could leave the un-educated trader banging their head on the keyboard, repeating ‘what went wrong?’ I know the feeling, but the market doesn’t work the way as everything else does in your everyday life. It operates in a more counterintuitive way, what you think might be the right way to do something is often the wrong way. You believe you enter a forex trade with military precision when really you’re as sloppy as a 2 year old with a crayon. The markets are full of deception, emotions, traps and psychological torture that will absolutely rip you apart mentally if you’re mind isn’t ready for trading. Trying to trade the market uneducated, or unconditioned is like trying to navigate your way through a land mine field, blindfolded. If a commercial airliner crashed without warning, investigators would act quickly taping off this accident scene to do some crime scene investigation. So let’s quarantine this type of aggressive trading and get a bit more of an understanding of why so many people churn and burn. When you enter a Forex trade by chasing price, there is an obvious lack of planning in the trade execution. Throwing orders at the market on the back of impulsive price movements might seem like the right thing to do in the heat of the moment. A decision making process like this is generally derived from ‘emotionally fuelled distorted logic’. Secondly, the trader has allowed the market create a high level urgency within themselves. Inducing that feeling of ‘if you don’t jump in RIGHT NOW, you’re going to miss this move and never get another chance’. The high sense of urgency throws trader’s into ‘panic mode’ and the need to take action, superseding any rational thinking. We’ve all been guilty of ‘chasing price’ at one stage. The market slapped us back in the face for it too. If you impulsively enter a Forex trade like this and it actually works out, you are at a high risk level of being a victim of the random reinforcement principle. You’re rewarded for the bad behaviour, which encourages you to do it more often. You won’t get the same result each time. It will be like a drug user ‘chasing that first high’. It eventually unravels you completely as a trader. If you really are passionate about trading and want to become a good trader, focus train of thought away from brute force attacks on the market. Projected your time toward proper risk management and logical trade execution. Timeframes are going to play a huge part in how successful you are as a trader. 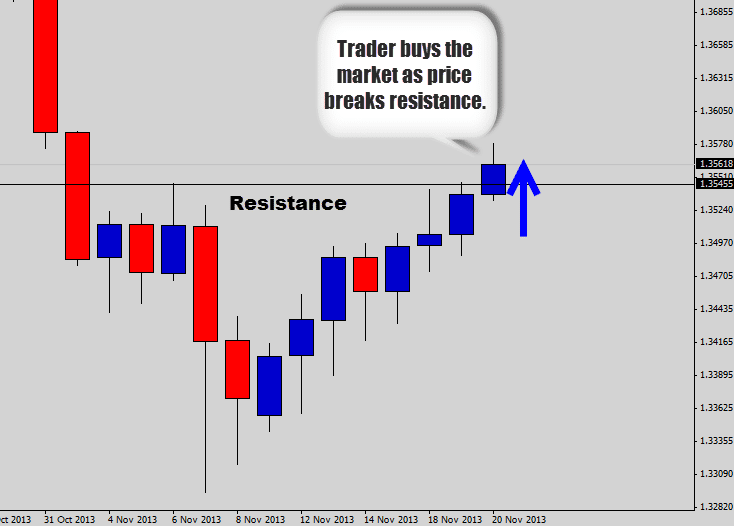 Generally when we first embrace Forex trading, we are easily lured into the lower timeframes. Other trades make promises that the lower timeframes offer ‘more trading opportunities’ and the ability to ‘make more money’. What they don’t tell you are the signals have much less value on the lower time frames as they do the with the higher timeframes. Low timeframes – Lots of signals, but low quality. Plenty of breakout traps to be caught up in, and lots of market noise. High timeframes – Less signals, but with low risk high reward profiles. Less breakout traps and more market stability and clarity. Don’t fall into the idea of trading on the lower timeframes will make you more money or enter a Forex trade via lower quality signals. You’re taking trades that contain no real substance or value. They don’t contain enough price action data, and expose you to a high level of risk. Intraday noise on the low timeframes can be so intense, trying to trade it is really just ‘chasing ghosts’. Just another typical breakout trap that occurs very often on these lower timeframes, like the 15 min chart. It’s hard to make sense of what’s going on here using these charts. Even with the best Forex trading strategy, you will still have to deal with the high level of noise and ‘false signals’ that plague these intraday charts. Market closes below support level and produced clear bearish breakout follow through. See how the daily chart just paints a much better picture of what’s going on in the markets. At first glance it’s easy to see this market has a dominant bearish trend momentum with very little noise. That’s why we recommend to make the switch to the higher timeframes. The signals are lower risk, the market has more stability and clarity, and you have less chance of being caught up in any whipsaw type movements. There are generally two ways you can approach your trading. You can be like most traders and sit there in front of the computer screen, watching the market tick around all day patiently wait for a signal to develop. Or, you can identify signals by checking in on the markets from time to time, using pending orders to enter a Forex trade. Pending orders are great for setting up your own ‘price trap’ to catch price exactly where you want and automatically enter the market for you. This saves you the mental punishment of staring at the charts, waiting for price to reach your desired entry point to pulling the trigger manually. There are two types of pending order options, Limit and stop orders. 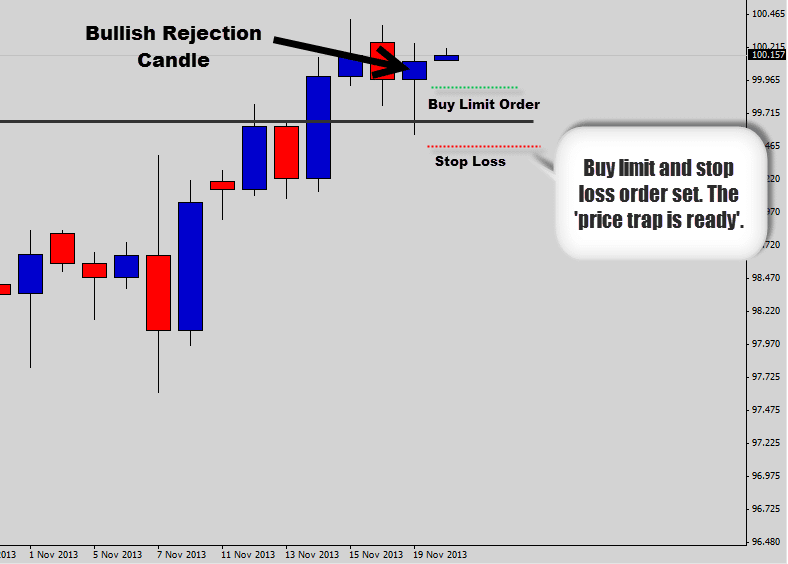 Stop orders are used to buy the market above current price, or sell below current price. Stop orders are used to catch breakout trades and we would typically use stop orders when setting up Inside Day and Indecision Candle breakout trades. As anticipated a retracement did occur and my limit order was hit and automatically converted into a market order. Once you’re order is set, its hands free from there. This type of ‘fire and forget’ trading is something we practice a lot. The price trap played out as anticipated and caught the retracement. This automatically converted my limit order into a market order. 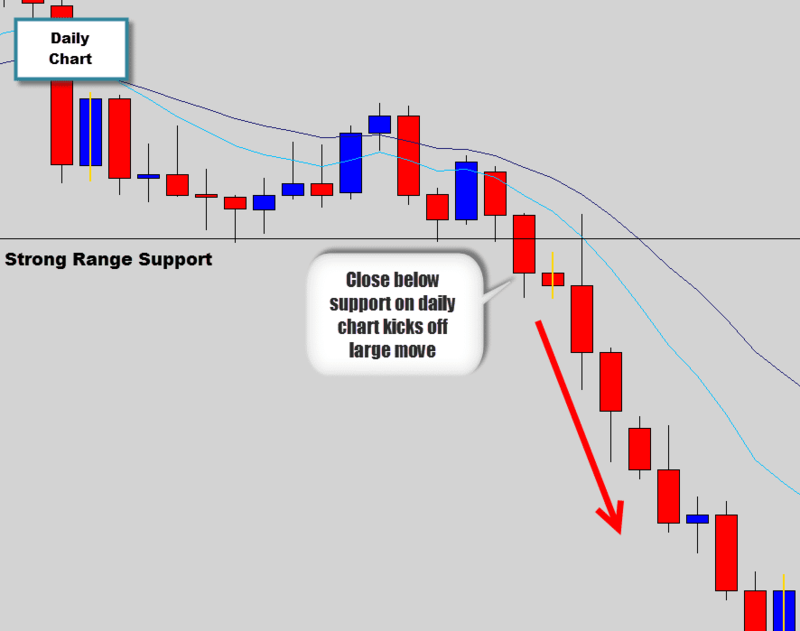 We use these type of entry / stop combo with our end of day trading strategies. It’s less work for us, and yields more results from the market. Think of it this way, you’ve got a problem with a rat that you need to get removed from your house. You’re not going to run around shooting off a rifle at anything that moves hoping to randomly hit it. Instead you set up a trap, bait it and let the rat get caught. The ‘set and forget’ approach here can be applied to the markets just as easily. Set up your price traps, let price come to you. 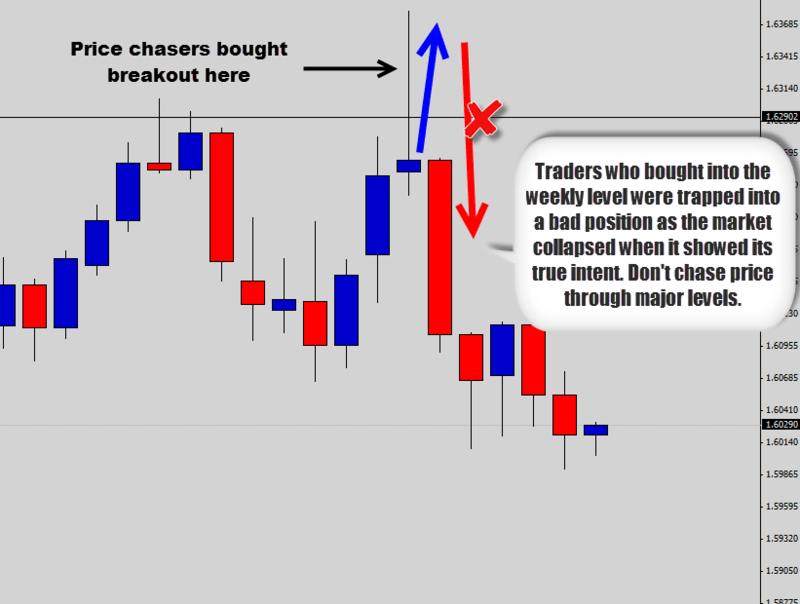 Don’t chase the market around and enter a Forex trade at random price movements. There are certain spots/conditions on the charts that are considered to be high risk zones to trade into, and should be avoided. 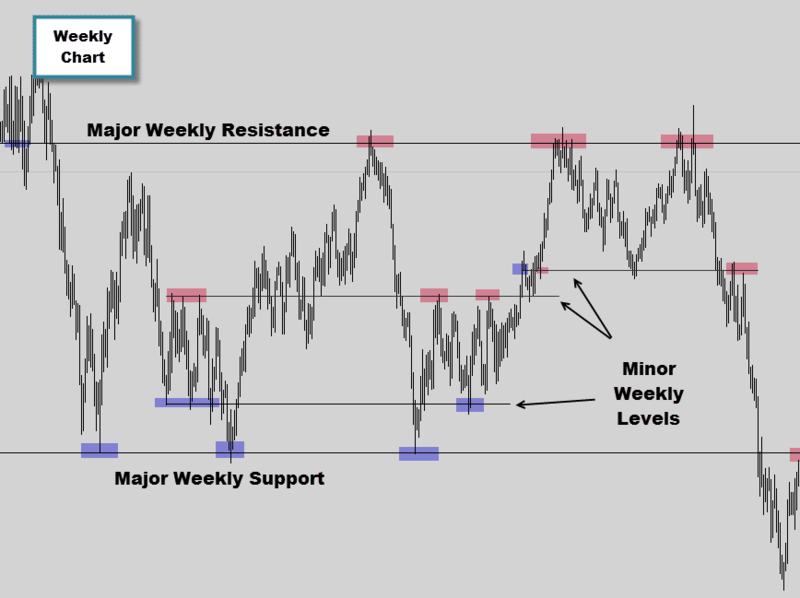 One of these areas are weekly support and resistance levels, which are one of the major turning points in the market. If you’re fixated on the 15 min chart, you may not even be aware of these levels. Open up your weekly chart and map out these major termination points. You will be amazed at the price action you can take advantage of here. Sometimes the market will create the illusion that a ‘breakout’ is occurring through these levels, drawing in unsuspecting traders into very bad positions. 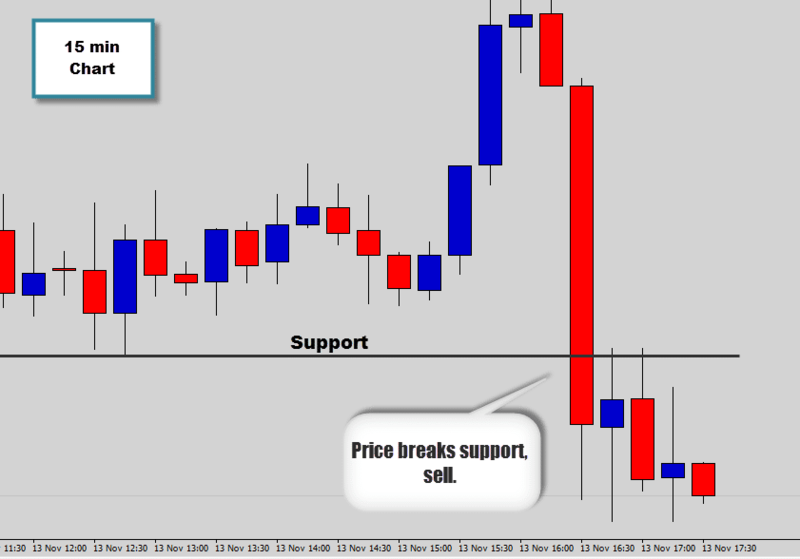 Weak traders enter a Forex trade from impulsive reactions triggered by events like this. 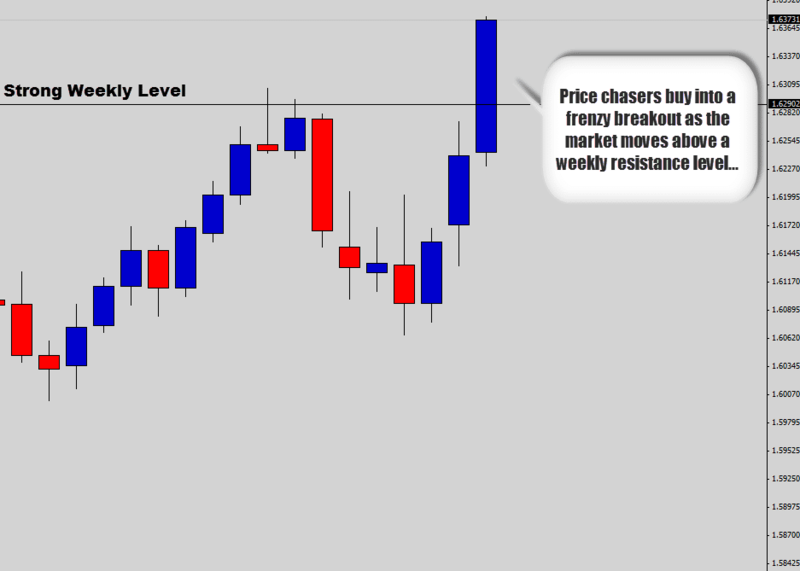 The break through the weekly level was a classic bull trap and absolutely destroyed everyone who ‘jumped in’ with the buying frenzy. Avoid trading into these major turning points on the chart unless you have a damn good reason. 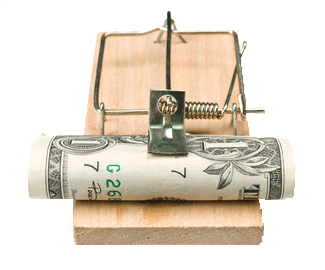 The market lays down these traps to wash out weak traders. Focus on trading away from these major turning points. Use strong reversal signals, or by waiting for a breakout then a retest from the other end. Are you guilty of using a ‘machine gun’ mentality, and offloading a bunch of orders into the market hoping one of them hit a target. If you really want to become a good, consistent trader, it’s time to move away from this savage mentality. Start trading with a cool, calm and collected approach. Plan out your trades more carefully, only load your weapon with one bullet. 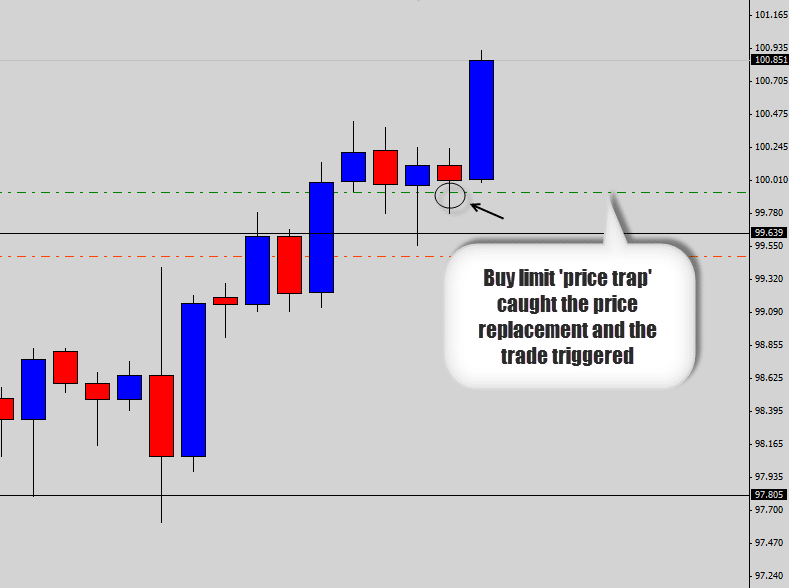 Pull the trigger and enter a Forex trade when the probabilities are in your favour. Make every shot count. After you’ve entered a position, try to be at least involved with it as possible. How many times have you missed out on potential profits from a trade because you’ve emotionally intervened? Don’t stare at the charts, don’t stare at your trades. Fire off your order, walk away and go live your life. If you think you you’ve been smothering the market too much and need to put some distance between you and the charts. 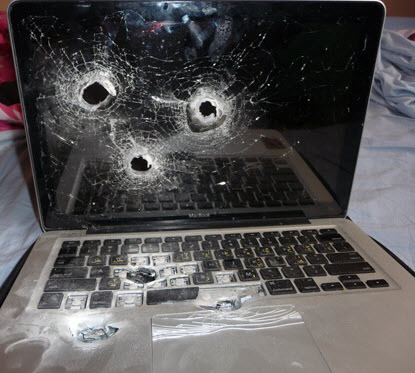 But you still want to be an active trader at the same time. You may be interested in becoming a war room member where we do exactly that every day. We teach price action trading techniques that allow to you to have a minimalistic approach to trading. You can achieve good returns on investment, with plenty of time during the day to do things you like to do. Stop by the war room info page, if you’re interested in more information on our War Room membership package. Cheers to your trading success. very very very very helpful. thanks a lot Sir. God bless you. A very high quality blog! good job. I think the breakout pullback entry is the most reliable chartism setup. Thank you very much for your effort. Your lesson to all those inexperienced hopeful souls is invaluable. I have been reading every single word you have written and you have opened my eyes to things I never thought of a and never heard of, despite being on many trading forums before. Million thanks and God bless . The reality is the lower tf results in much more accurate entries, while high tf results in higher Pip-drawdown situations. Higher tf traders have to be willing to risk more pips, because of whip lash which will occur prior to a candle being closed on their tf. I can see you're over zealous about high frequency trading - which is fine all the best you, but some of these statements are extremely naive. I am guessing you're just trolling but I will bite. "higher Pip-drawdown"This comment is really shortsighted, and it means you don't fully understand lot size calculations. Its all about pre-defining your risk for any stop loss size - I can risk $1000 into 20 pips, or 100 pip. If you just use a constant lot size figure across all trades, then no wonder you're scared of trading the daily chart. "whip lash which will occur prior to a candle being closed"Ridiculous statement. You're saying there is a huge volatility spike at the daily candle close - I don't know where you got this idea from. The New York close is a pretty calm. May I simply just say what a comfort to find somebody that truly understands what they're talking about online. You actually know how to bring an issue to light and make it important. More and more people really need to check this out and understand this side of your story. I was surprised that you aren't more popular given that you definitely have the gift. I average 40 to 70 pips a day when I do trade lower TF 5 and 15minute charts are my entry points the system I use recognizes the buy sell extremes once price enters my zone I place the trade nothing special just patience and discipline according to my rules I only trade 1 to 2 hours a day during overlap times. I like your daily strategy I'll open a account designed for this method. A wonderful piece! But, I'm a novice. I want to be an active trader. I need help! Your article is so so good,keep up the good work..